If 3D printing has changed the industries of tomorrow, how can your organization get ready today? Additive manufacturing, better known in the market as 3D printing (3DP), has been evolving over the past 30 years. There is growing evidence that the advancements in technology and materials have finally brought it beyond the hype stage. Several trends in the business world have accelerated 3DP onto executive agendas. About one-quarter of global companies already use 3DP, with another 12% considering it. Individualization. There is a large push in the modern economy for the personalization of manufactured products tailored to consumer needs. Manufacturers have responded by embracing 3DP to enable them to print parts as close to the time of assembly as possible. Democratization. 3DP makes it easier for individuals or collaborative teams to design or manufacture end products and reduces barriers to innovation. The product maker, who may be stymied in a traditional bureaucratic setting with difficult requisition processes and long logistical wait times, would now have options to make products quicker. Sustainability. There is a global movement toward sustainability for the home and also for corporations of all sizes. 3DP reduces transport costs when the 3D printer is placed close to the manufacturing line. Beyond prototyping applications impacts process designs. 3DP was originally limited to prototyping. Now, 3DP methods such as direct metal laser sintering, selective metal sintering and electron beam melting have advanced 3DP into industrial applications and final assemblies. Lightweight materials. Honeycombing, another 3DP method, allows especially lightweight parts to be printed. It is possible to create hollow parts or parts with an inner chamber that are connected in a fashion similar to the inside of a bee’s nest. Fewer components for complex geometries. 3D printers are able to make different compositions of metal alloys to suit the end-product needs. The opportunity to test different compositions easily and cheaply can trigger the creation of materials that have not been seen before and may be better suited to meet certain design specifications than traditional materials. Science and technology advancing materials management. 3D-printed parts will change the inventory mix and alter tracking processes. RFID technology will not necessarily become a thing of the past; however, metal powder for printing will be purchased in such large volumes that RFID tags may be the less useful technology to trace powder from the source to use in producing 3D-printed parts. 3DP has made ripples through various industries. 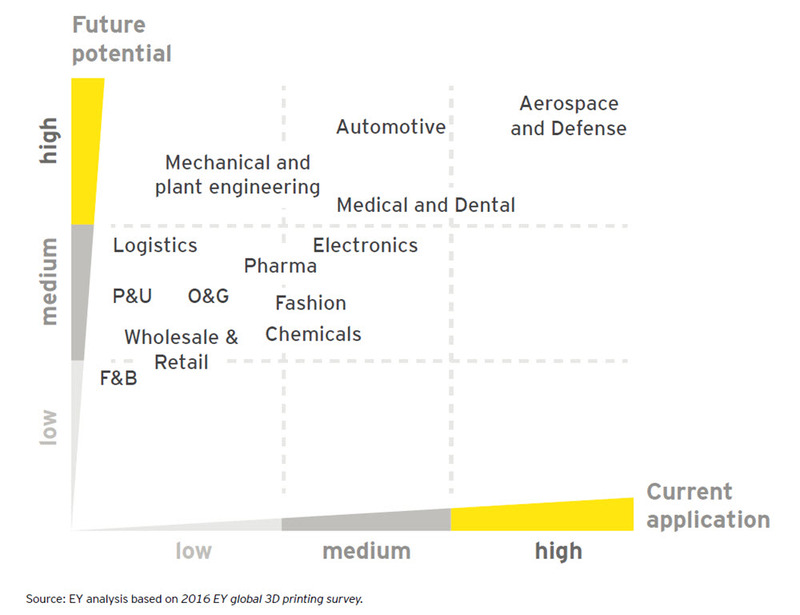 The industries can be mapped based on their current level of applying 3DP, compared to the future potential. Aerospace and defense. Using 3DP technology rather than traditional methods is yielding products that are faster, lighter (better weight to thrust ratio), less wasteful (more fuel efficient) and more financially viable. Health care. 3DP has enabled a more patient-centered approach in medicine by offering customization of prosthetics and dentistry, and by enabling bio-printing, where scientists print human-sized bones, cartilage and muscle. Food. From crystalized sugar cake toppers and intricate chocolate designs, to cracker-like yeast structures with seeds and spores that sprout over time, to ready-to-bake pizzas and filled ravioli, printed food has the culinary community talking. For a detailed review of the status of 3DP in the resource, automotive, and consumer products industries, and the factors that could determine the nature of future adoption, read the full report. Quality. With current laws clearly out of sync with this rapidly emerging technology, 3DP leads to many unanswered questions around liability. IP protection. Public access to blueprints online raises copyright and intellectual property (IP) right concerns. Taxation. Current multinational tax profiles based on minimizing IP profit rely on non-IP related substance. There is likely to be a major question as to the point of production of an object, since 3DP does not necessarily align profits to people and their functions for taxing purposes. VUCA (volatility, uncertainty, complexity and ambiguity). Companies face both macro and industry-specific needs and business challenges such as economic uncertainty, cost volatility, pricing pressure, increasing customer requirements and operational challenges for assuring fast response to these customer needs. Lack of awareness. The level of awareness of the state of the art of 3DP and its application is very low in many companies. Inexperience. Organizations start gaining experience with the technology by testing it in different areas and applying it to certain sectors like product development or engineering. For most companies, 3DP is very new and a potentially dramatic change for both operations and the business. Many organizations need help understanding how the technology can transform them and how they could optimally lead this transformation. Generally, 3DPcould help companies gain competitive advantage, improve their positions in the value chain, achieve growth and increase the efficiency of their supply chains and operations. The first movers that successfully adopted 3DP viewed it as a strategic move and had a clear vision of what 3DP presented to their business. EY can help companies understand the biggest value of the 3DP application for the business and help them trace a path to it. Creating organizational awareness. The aim of the first phase is to raise the level of the client’s awareness, enabling joint working to identify 3DP potential. Performing a 3DP diagnostic. During the second phase, the focus is on identifying the areas of application and use cases that would bring the highest added value. Developing a transformation road map. In the third phase, we help consolidate, prioritize and build a three- to five-year transformational road map. Supporting implementation. 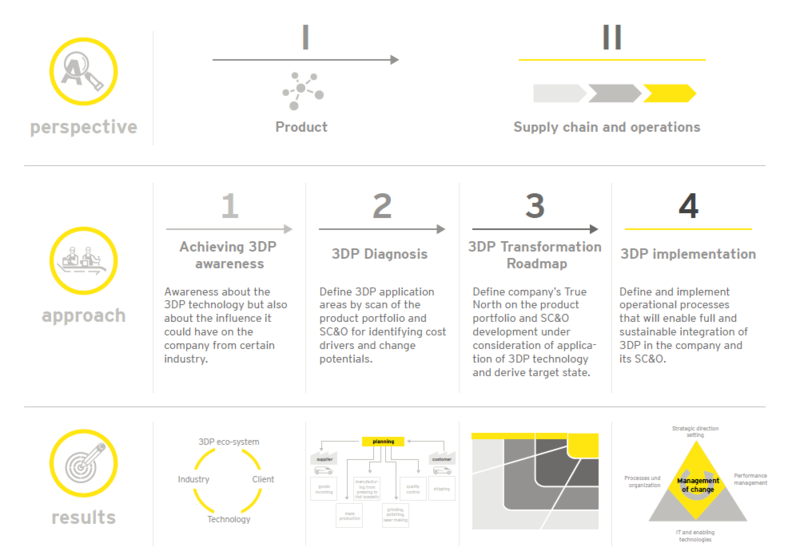 In this phase, we support the client with the definition and implementation of operational processes that are required for the full and sustainable integration of 3DP in the organization and its supply chain. For more information, contact global3dprinting@ey.com.